A group of students from Belmont’s O’More School of Design spent the holiday season spreading cheer in a unique sort of way as they “Reimagined the Holidays with Goodwill.” The team, made up of five fashion merchandising students, created an original display inside a local Goodwill store made entirely of merchandise including a basket of toys, a piano and a garland-draped hat rack. The display’s feature piece was a tree-shaped stack of paperback books atop a coffee table – all surrounding a red couch. 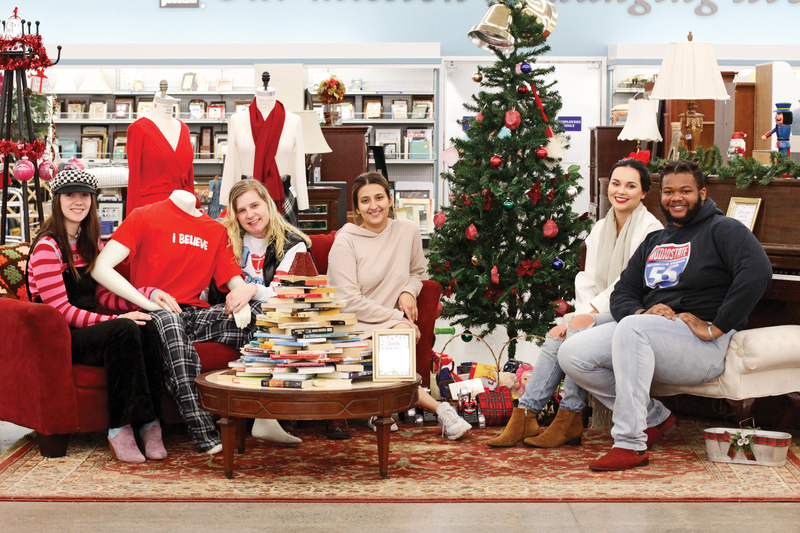 The exhibit was featured in an article recently published on Goodwill’s Blog where the students discussed their experience as budding fashion professionals, highlighting their work and inspiration. Beyond the point of decoration, Lowe said she and her team wanted their display to encourage creative ideas for ordinary items — like turning piles of books into a tree or creating ornaments out of cupcake liners. Understanding the budgetary restrictions of many young people, the target age group for the display, the team was keen on identifying ways to re-imagine Christmas with a eye towards being thrifty. As for the feature’s popularity? The store could barely keep it in place for customers flocking to the couch, attempting to buy it piece by piece.